Let’s start with this crazy question, what do the words February, love, dates and fish all have in common? 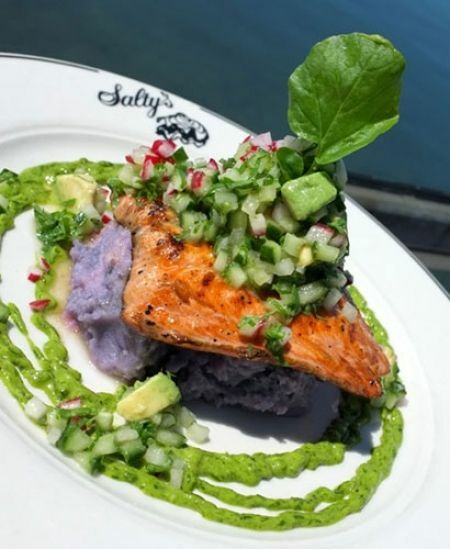 Sure Valentine’s Day is an easy guess and a date at Salty’s for some great seafood would be a brilliant answer (make reservations at saltys.com) but there is more to this combination of words than meets the eye. They all have to do with this wintry time of year and the effect it has on our minds and bodies. As we round the corner into February, the long dark days of winter are still with us. We know that spring is coming soon but by now we are really wishing it would hurry up. What causes this? Let’s not get into a discussion about the earth’s axis and rotation here, but shorter time periods between sunrise and sunset, along with too much time spent indoors, can be the culprits. How can we fool Mother Nature and get around this annual phenomenon? There are a few things we can do. First of all, bundle up and get outside no matter the weather. The outdoor O2 air makes you feel energized and is so much better for you than the indoor re-circulated variety. Even a few minutes can brighten your day. Love gets extra focus in February and as it turns out, Cupid’s “Will You Be Mine” arrow actually produces effects that are good for us. Loving and being loved actually helps us stay healthier. Studies have found that our feelings of love decrease the risk of disease and increase both our ability to heal and our levels of immunity. And, hey, love gives us warm feelings so there you go, it’s another way to beat the cold winter blues. As for dates and fish, it turns out that they are included in a list of great foods for this hibernating time of year. Why? Because they contain a substantial amount of the nutrient tryptophan. The essential amino acid tryptophan is actually a precursor and building block to a very important molecule called serotonin. Serotonin is a neurotransmitter that relays signals in the brain that influence sleep, appetite and mood among other neurological functions. Low levels of serotonin have actually been found to be instrumental in sleep apnea, obesity and depression. Foods that can increase the production of serotonin include salmon, dates, papaya, banana, whole grains, peanuts, seeds, poultry and dairy products. So focus on these foods and you might notice a difference. If you would like to read more on this topic, I recommend that you visit livestrong.com, an excellent website on diets to help you live strong. February, love, dates and fish — four fun words for the winter season.